It was the Irish feel around the rink at the Barrie Molson Centre on Saturday night. The annual St. Patrick’s Day game was played against the Sudbury Wolves. It was the second game of a home and home between the two teams and was the final regular season game of the season for the Colts. The scoring got started with a milestone marker. It was Zach Magwood notching his 50th career OHL goal early in the opening frame. Assists went to Ryan Suzuki and Ben Hawerchuk. It didn’t take long for the second Barrie goal to go up on the scoreboard. Lucas Chiodo was fed a pass leaving him wide open on the side of the goal as he put home his 30th of the year. Suzuki and Magwood assisted on the play. The floodgates were open. On a barrie penalty the Colts were still able to strike. Jaden Peca came down the wing and hammered a slap shot past the Wolves netminder to make it 3-0. 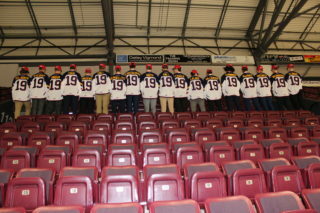 Jason Willms and T.J. Fergus would tally assists on the goal. They were relentless on this evening. Magwood would add another before the end of the period making it 4-0 for the home team. Joey Keane and Chiodo would add apples on the play. The Wolves came back from a 4-0 deficit last night and wouldn’t give up tonight. Blake Murray added two before the buzzer would sound, making a game out of this. Barrie wouldn’t let those late goals phase them. Early on in the second on a powerplay it was Ben Hawerchuk pouncing on the rebound and potting home his 12th of the year. Justin Murray and Peca assisted on the goal. The boys kept coming, and it was an unlikely goal scorer Chris Cameron potting home his 2nd of the season. Suzuki and Chiodo would grab the assists. Rarely do the Colts get to seven goals without the top line contributing, but that’s how it was. It was Andrei Svechnikov getting his 40th goal of the season. Dmitry Sokolov and Tyler Tucker assisted on the goal. Barrie would just try to ride out the remaining 20 minutes of the game. The horn would sound and end in a 10-3 victory for the Colts. That wraps up the season as the Colts finish with a 42-21-4-1 good for 2nd in the Eastern Conference. 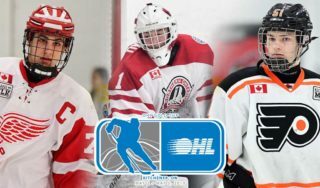 They will await tomorrow’s final day of the regular season to see if they will be facing the Mississauga Steelheads or the Ottawa 67’s in the first round.